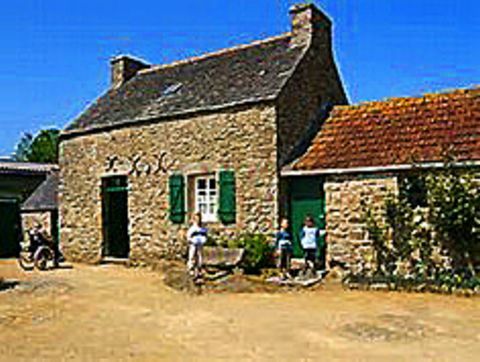 At the far western end of the country of France, about one mile from the coast of the English Channel is the small area called Kerizinen which was too small to qualify as a hamlet. Kerizinen only contained a few ancient and poor homes built of rock. On September 15, 1938, a sad and lonely woman, Jeanne-Louise Ramonet, was patiently knitting on an embankment while watching over her milk cow grazing in the meadow. It was one of those pale, sunny days typical of Brittany. Since the age of two, she had been afflicted with a paralysis of her right leg, causing a serious limp. Her family had either grown and moved away or died from typhoid, so she remained alone in this small bleak home about the size of an average kitchen. Her health issues caused her education to be “very scanty.” In 1936, the parish priest arranged for a free trip to Lourdes with a group of sick people. Although she was not instantly healed in the waters at Lourdes, she did find her health improved enough after her return to walk better and get more work done. Having said only this much, the Lady “rose slowly, slanting toward the north, and disappeared very high in the sky. Jeanne-Louise was stunned. She told nobody and kept the secret in her heart. 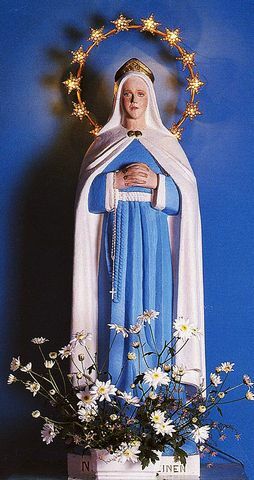 She said that she knew that this was the Virgin Mary – described as a “beautiful young lady of seventeen years old.” Her dress was a “very sweet” shimmering deep blue, and her eyes were of the same shimmering color. The dress was undulating at the bottom and had a white border. The sleeves also ended in white borders. A double white ribbon girded the dress at the waist. She wore a shining white mantle, held at the neck by a golden rectangular hook. The mantle covered her shoulders and extended to below her knees. A very light, extremely white veil covered her hair. She stood motionless as she spoke; her head was slightly inclined to the left. The arms were positioned as if in prayer, her fingers crossed on her chest. Her left arm was holding a rosary. 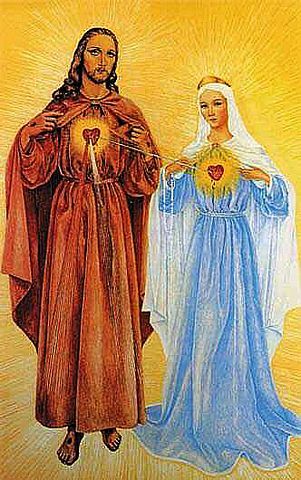 Jeanne-Louise immediately told the priest about the first two apparitions – as the Holy Mother had requested. But the priest forbid her to say a word about them. For the next eleven apparitions over the next nine years (until October 4, 1947), only Jeanne-Louise and her priest knew about them. Because Blessed Mary sternly admonished the priest in certain messages, the last two sentences of the second message and all of the thirteenth message are usually omitted. Apparitions that chastise the clergy are not easily heard or accepted. It is highly unlikely that this poor, simple-minded woman in this isolated out-of-the-way locale could have any intelligent knowledge of the warfront or current advances. Her priests would similarly be isolated and unlikely to know anything either. 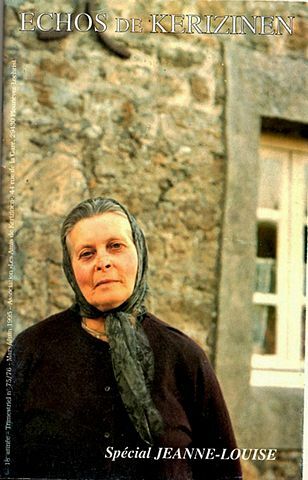 Immediately after the thirteenth apparition on October 4, 1947, Jeanne-Louise limped the two miles to the village priest at Plounevez-Lochrist to again tell what she had seen and heard from Blessed Mary. This time, though, the conversation between her and the priest “was overheard by a young girl who listened attentively” and then eagerly rushed to the village school with the details of the apparitions – which then spread to the village. But, most did not believe any of it. A few began praying in the meadow near Jeanne-Louise’s house – and asked her many questions as well. Jeanne-Louise repeated all of the messages to those who inquired, word for word as retained clearly in her memory. This included the stern admonishments given to the clergy during the thirteenth apparition for their failure to publicly broadcast the messages, including the warnings and calls for prayer. Soon, a small shrine was set up in the meadow. Flowers were deposited and candles were lit. Small groups began attending, especially when Jeanne-Louise narrated the new messages, #14 through #21. In late May of 1949, a woman from Plounevez-Lochrist had become seriously ill. When brought to the hospital, she was declared a “desperate case with death imminent.” Visionary Jeanne-Louise joined others at the meadow shrine and began a novena to Our Lady of the Rosary of Kerizinen for that lady’s health. The 22nd apparition happened on May 24 during the novena. The others saw a “globe of light” descending over Jeanne’s house. Taking the flowers at the apparition site and weaving them into a wreath, the visionary asked several others to take them to the sick woman in the hospital. Although the good people were denied access to the dying patient’s room, the religious sisters agreed to deliver the flowers to her bed. As soon as the flowers touched her bed, the dying woman began to speak. All present were astonished and watched as her pulse and temperature became normal again. She was miraculously healed. Word of this miracle spread fast and attendance at the meadow shrine increased rapidly. 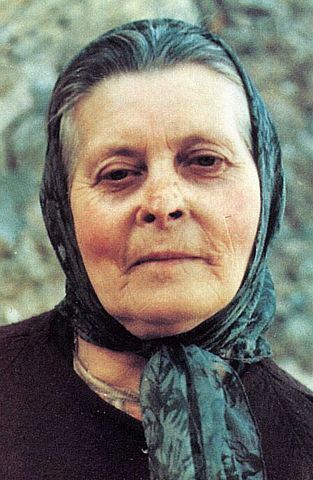 During the 23rd apparition on August 6, 1949, Jeanne-Louise asked the Blessed Virgin about the absence of good drinking water within a mile of the apparition site. Blessed Mary promised that she would “bring forth a source to gush water.” Three years later, on July 15, 1952, water started flowing from rocks and increased in its flow as more people desired it. The water is still flowing today, and many have claimed miraculous healings from using it. On December 8, 1953, about a thousand people were reciting the rosary under gray clouds and a thin rain. Our Lady did not appear, but, at 3:00 p.m., as the prayers and Hail Mary’s came to a close, a “strange light attracted the eyes of all to the sky.” The clouds suddenly disappeared and a “very red sun detached itself from a part of the blue sky.” Witnessed by everyone present, the sun seemed to “fall down” and then split into two parts. News of these remarkable phenomena, attested to by over a thousand witnesses, now began to radiate through Brittany and the rest of France. Tradition indicated that a monastery had been built long ago in the meadow of the apparitions, and that Jesus had often appeared there! Nonetheless, the bishop did nothing! Some of the townspeople compensated by constructing a small, forlorn, shed-like structure on the site. A life-size statue of the Virgin Mary was placed inside. Despite the small size, crowds as big as 6,000 people would gather around this “chapel” – especially on feast days, which must have embarrassed the local clergy. But the bishop ignored the visionary’s words and request – and began increasing his public declarations against the apparitions at Kerizinen. No official inquiry was ever held for investigating these apparitions – despite the many supernatural occurrences witnessed by thousands. It was later revealed that Jeanne-Louise had been given “an animated tableau” during the eleventh apparition on May 1, 1944. She was shown images of men hoisting a red flag, and priests trying to stop them. The priests were threatened, abused, and stones thrown at them. In a corner of the “tableau” the devil appeared very happy, encouraging the abuse of the priests. In another corner was a weeping Blessed Virgin. The inscription on the tableau read, “The Image of Communism.” What is significant is that the worldwide threat of Communism was not fully realized until after 1953. At the time of this “tableau,” the Soviet Communists were the much-appreciated allies of the West. During 1961, Jeanne-Louise became increasing disabled and stayed home more frequently. After 1978, obscurity descended over these apparitions. Devout groups in Canada, France, and Belgium have worked to perpetuate the memory of holy events at Kerizinen.